Searching Google for "cerebellum" yielded 2,150,000 claimed references. "The cerebellum (Latin for little brain) is a region of the brain that plays an important role in motor control." The cerebellum does not initiate movement, but it contributes to coordination, precision, and accurate timing. It receives input from sensory systems of the spinal cord and from other parts of the brain, and integrates these inputs to fine tune motor activity. (3) the default-mode network (lobule IX). 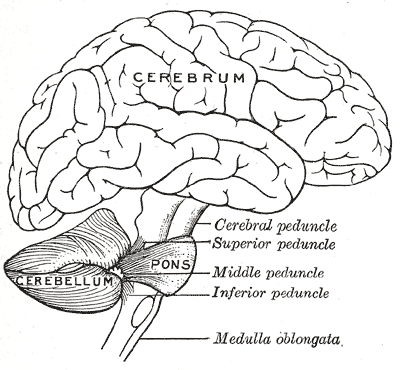 Little to no overlap was detected between these cerebellar regions and the sensorimotor cerebellum (lobules V-VI). Clusters were also located in pontine and dentate nuclei, prominent points of convergence for cerebellar input and output, respectively. The results suggest that the most phylogenetically recent part of the cerebellum, particularly crus I and II, make contributions to parallel cortico-cerebellar loops involved in executive control, salience detection, and episodic memory/self-reflection. The largest portions of the neocerebellum take part in the executive control network implicated in higher cognitive functions such as working memory."